Knott published 12 books between 1968 and 2004—with a variety of small and university presses, as well as major houses—but stopped in 2005 after his FSG book The Unsubscriber received a mixed response and was then remaindered. 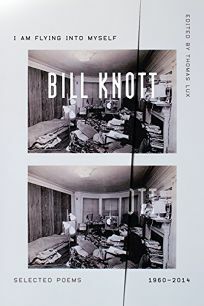 After that, Knott eschewed publishing through anyone but himself for the rest of his life, self-publishing re-anthologizations of his older work and new poems for almost a decade. The timing of his exit from traditional publishing was terrible for me, having just started an independent press for the purpose of reissuing his early works. As a former mentor of mine, Knott had been a huge influence and continued to send me his books—often dedicated in crayon—for years after I graduated. But whenever I tried to talk him back into publishing with Black Ocean, he staunchly refused. It stung, of course, but in some ways only deepened my appreciation of his dedication to poetry itself. So when I pulled the handsomely typeset and carefully curated galley of this volume from its envelope, I simply placed it on my desk, stared at it, and eventually began to cry. This was the collection many of us had long been waiting for and perhaps the book he never wanted to be printed. It seems everyone who knew Knott has a story illustrating his eccentricity. There is so much mythology surrounding his life it's hard to leave any of it out, but really it all boils down to the portrait of a man who was orphaned as a child, institutionalized as an adolescent, struggled with depression as an adult, and remained an outsider (socially, professionally, and artistically) his entire life—yet often shone with kindness and beauty, and above all remained passionately committed to his craft. As Lux writes in his introduction, "Knott did not become an exceptional poet because… of any kind of suffering. Everybody suffers. He became an exceptional poet despite those things." Working across forms and styles, Knott remained a lyric poet at core over the decades. Loaded with images, at times epigrammatic and often absurd or surreal as he trafficked in metaphor more often than simile, Knott's poems relentlessly compress language and his lines distill to their throbbing quick. His tragic poems are funny, and his comic poems are sad; his surreal poems are rebellious, and his political poems fantastical. His love poems are incomparable and are where he shines brightest—perhaps because in love he found all those heartbroken, joyful, radical, and strange themes entirely at once. Knott was both a man and a poet of paradox. Even after more exemplary books under his belt than most poets manage in a lifetime, he publicly disdained the business of writing. From Charles Simic to Richard Hell, poets laureate and rock stars alike praised his work, yet most students have never read him. Perhaps this book will provoke some sea change and bring him the recognition he deserves; I hope it does. But if not, that's probably how he'd like it nonetheless. Janaka Stucky is publisher of Black Ocean and author of The Truth Is We Are Perfect.